The state highway 35 freeway has been on the Houston master plan since the 1960's, and in 1996 the first construction finally began. 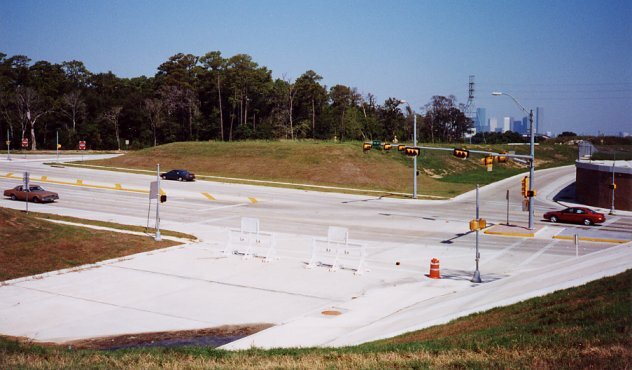 The short segment of feeder roads from I-45 to Old Spanish Trail was completed in the first quarter of 2000. As of August 2000, there is no contruction in progress, and no further work has been funded. When this freeway was added to the Houston master plan in the 1960's, it was expected that the corridor of this freeway would become heavily urbanized. Well, it didn't happen. This corridor is still largely vacant, with scattered warehouses and light industrial zones. Even today, there really is no need for this freeway. However, the suburban pastures at the south end of corridor near Pearland are slowly urbanizing, so someday there will be a need for the freeway. Preserving the corridor is good planning by the Houston authorities. 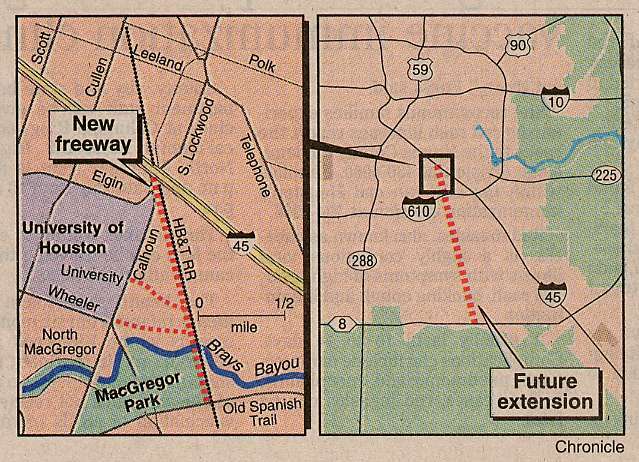 See a Houston Chronicle article from July 10, 1996, when construction began. A view of the current freeway terminus at 90A (Old Spanish Trail). Photo taken August 2000. Only feeders exist at this time. A view of the short length of freeway just south of I-45. Traffic exits to the feeders. Photo taken August 2000.